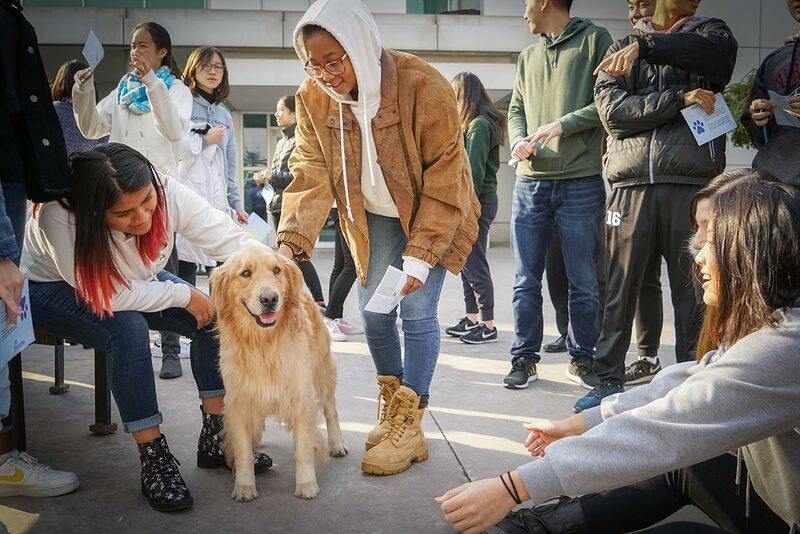 The International School of Beijing (ISB) got an unusual visitor on Thursday, when High School members of the Psychology Club organized for a therapy dog to come to campus to help relax their fellow hard-working students. Therapy dogs are trained to provide affection and comfort to people, typically in places of need like hospitals and nursing homes. They are thought to help reduce stress and anxiety. In the case of ISB, golden retriever Andy provided a bit of fun and a break from academics for the scores of students who came to see him. Twelfth grader Annie Y, who co-founded the ISB Psychology Club, wanted to bring a therapy dog to school to boost student wellness. Being so interested in psychology, she knows about the benefits such enjoyable experiences can have. "I've been passionate about psychology since ninth grade," she said. "It's been really interesting to learn about human behavior and how things are affected by what's going on in your mind." Annie had to show the tenacity of a dog digging for a bone to make the project happen. ISB has a no-animals policy, so Andy was the school's first four-legged guest. 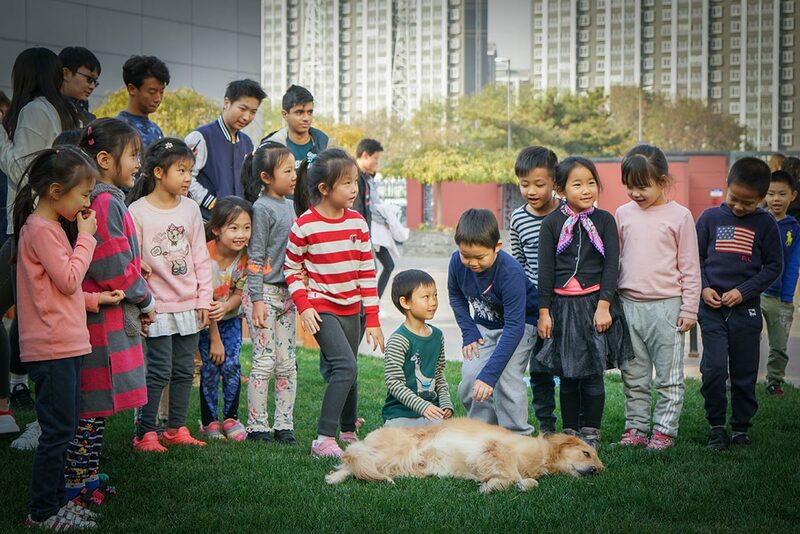 There are also very few therapy animals in China, so it took months of phone calls, meetings, and pitching the idea to senior members of faculty before Andy got a campus visitor pass. Of course, he had an experienced handler from the childcare center that generously let him out to come visit. This wasn't the only activity promoting wellness and a sense of community around school this week. ISB's Whole Child approach values young learners' health and integrity along with their academic performance, and Kindness Week has become an annual fixture when students get together to perform small benevolent acts to brighten people's days. It is organized by Peer Helpers, a group of High School students whose mission is to create a positive environment for the community. Activities have included students welcoming and holding doors open for people arriving at school in the morning, group discussions, and a "kindness tree" noticeboard of well-wishes.